For much of the season, the Yankees have been waiting for Mark Teixeira to carry the load. With two homeruns in the weekend Subway Series, that wait may finally be over. After a dominant performance against the Mets, all signs are pointing to a big summer for CC Sabathia. One day after hitting a game tying home run off Mike Pelfrey, Teixeira struck the big blow in the Subway Series finale by belting a grand slam off Johan Santana. Teixeira’s home run, which just made it over the wall in right, represented the only runs of the game in what otherwise was a strong pitching matchup that lived up to the advance billing. In the fateful third inning, Santana found himself in a bases loaded, no out predicament thanks to a bloop single by Brett Gardner, infield hit by Derek Jeter and perfectly placed bunt single by Nick Swisher. After giving up the grand slam to Teixeira, Santana kept the Yankees off the board for his final four innings, but the damage had already been done. 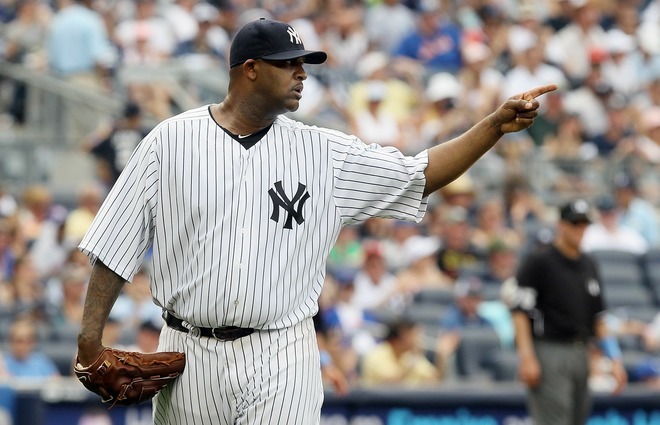 One run would have been enough for CC Sabathia, who needed only 100 pitches to get through eight shutout innings. In addition to locating his fastball, Sabathia also exhibited outstanding command of his changeup and slider. For most of May and June, Sabathia has struggled to control his entire arsenal, but on this afternoon, the big lefty had everything working. If not for a rain delay before the bottom half of the eighth inning, Sabathia probably would have notched a complete game shutout. Sabathia has traditionally been a better pitcher once the calendar turns to summer, so his performance against the Mets has to have the Yankees feeling good about their ace going forward. The Mets, on the other hand, may be scratching their heads a little about Santana. For the third straight start, Santana yielded four runs, but even more concerning is his velocity continues to remain a notch below his norm. Santana has still pitched relatively well, but there are some questions about his ability to regain his pre-injury dominance. Meanwhile, the Yankees biggest concern remains Alex Rodriquez, who saw only eight pitches while going 0-4. Since returning to the lineup, Arod has gone 2-18 with one run batted in. In addition to struggling with the bat, Arod also exhibited minimal range on a couple of groundballs and was eventually replaced by Ramiro Pena in the ninth inning. It’s one thing to have a healthy Arod in the lineup, but if he is compromised by his hip and/or groin, having him in the middle of the lineup actually serves as a detriment. It could be that Arod has been slow to get re-acclimated, but if an injury still lingers, the Yankees might be better off placing him on the DL. Regardless, Brian Cashman needs to be proactively scouring the majors for a right handed bat, preferably one who can play third, just in case Arod is eventually forced to miss an extended period of time. Even with the usual injury related concerns, the Yankees still find themselves in sole possession of first place for the first time since April 21. For much of the season, guys like Cano, Swisher, Hughes and Pettitte have carried the load, but as the season heads toward the dog days, the Yankees will need Teixeira and Sabathia to do a lot more heavy lifting. If today’s game is a harbinger of things to come, the Yankees can look forward to two pairs of very broad shoulders.